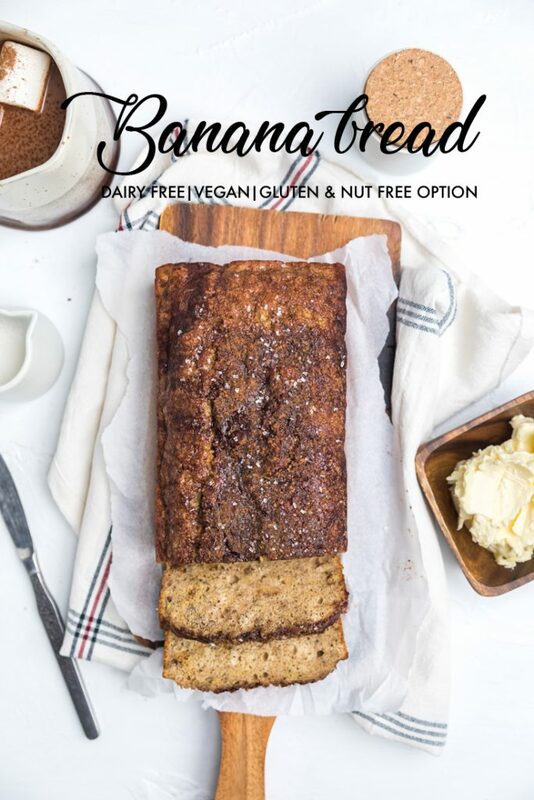 This Dairy Free Banana Bread is absolutely delicious and made in just one bowl. Completely vegan and can be made into a gluten free dairy free banana bread. In the warmer months of the year, all you want are ice cream and quick meals like pasta salad or sandwiches. No one wants the oven on during those months and for sure no one wants to be standing over the stove cooking hot food for hours on end. Winter, however, all that changes. Many of us love throwing things into the oven just to heat up the house a little warmer. Comfort foods, soups, and delicious warmed baked goods are the perfect addition to any cold winter day. Insert: Dairy Free Banana Bread. It’s the perfect way to start your day on a cold winter morning. 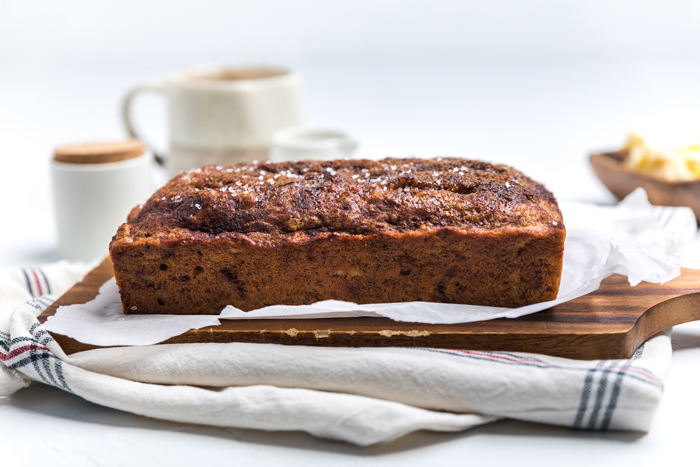 Even if it’s not winter, this dairy free banana bread recipe is the perfect accompaniment for any day of the year truly. It’s also a completely vegan banana bread recipe. I may even venture to say it’s the best vegan banana bread recipe. Best of all, it’s one of those delicious recipes that you would never even know it’s a healthy banana bread recipe. You won’t miss any of the ingredients that it’s without. 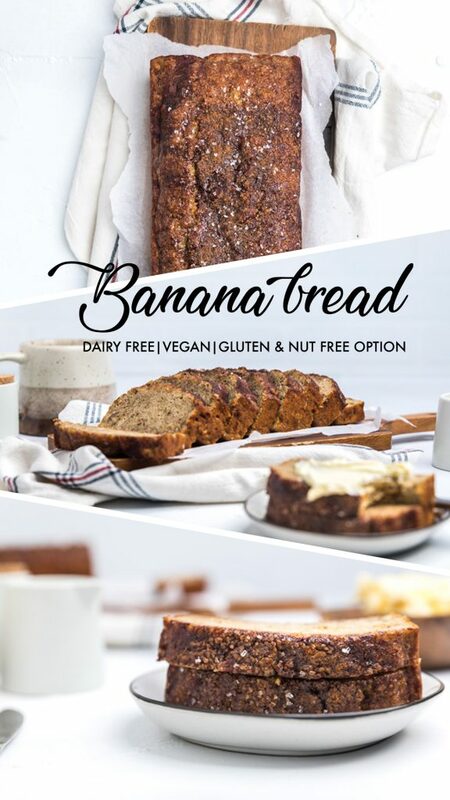 What ingredients do you need to make Dairy Free Banana Bread? 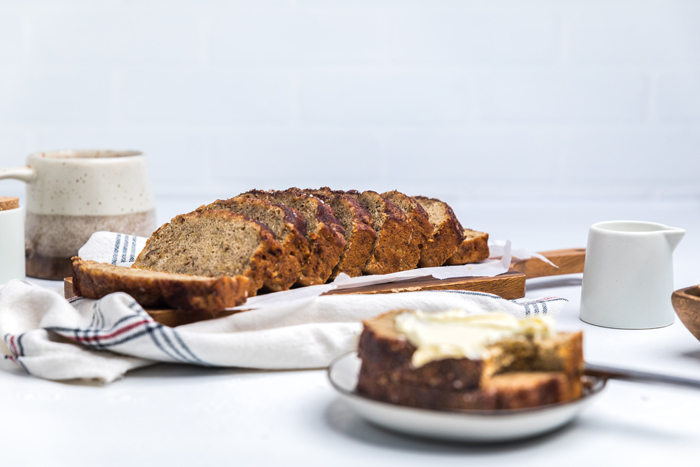 In order to make this a dairy free banana bread recipe, you’re going to want to start by getting everything prepped and ready to go. We always recommend having everything sat out and prepared ahead of time, and that’s just as true with this vegan banana bread recipe. How do you make Dairy Free Banana Bread? Believe it or not, this dairy free banana bread is super easy to make. 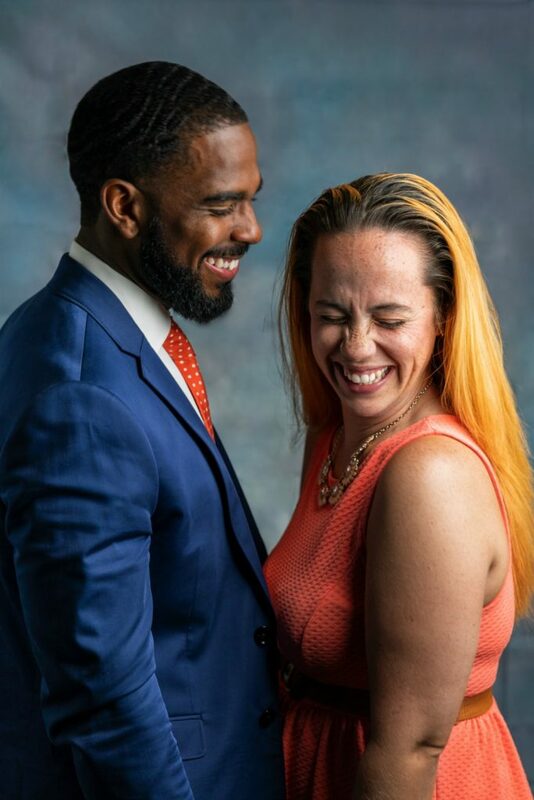 Winning, right? In fact, all you need is just one bowl to make the entire recipe. Out with recipes that you need a bunch of bowls and steps, everything for this vegan banana bread recipe is included easily. In order to make this recipe, you’ll start by mixing all the wet ingredients together into a bowl. Then, you will sift in the dry ingredients and then stir again. Finally, fold in the walnuts if you are adding. Pour the dairy free banana bread mixture into a greased bread pan and bake. It’s that simple. 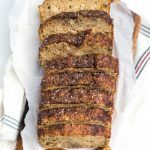 Delicious dairy free banana bread! 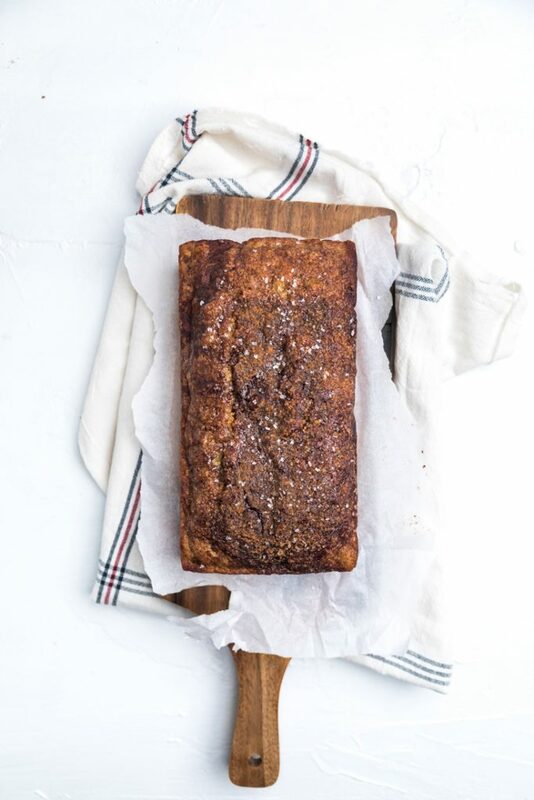 Can you freeze this Dairy Free Banana Bread? 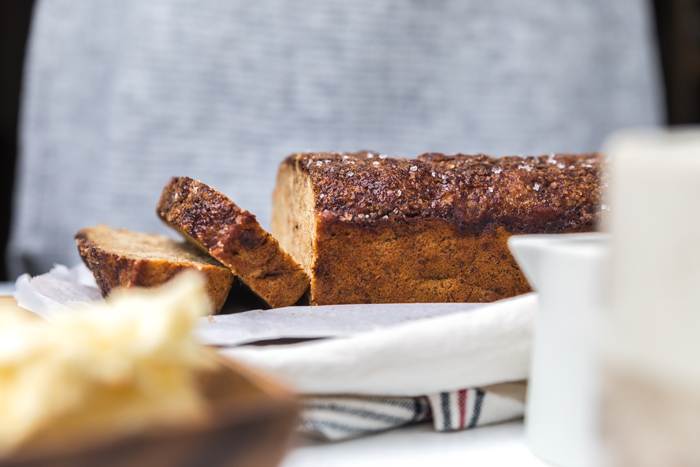 You can absolutely freeze this dairy free banana bread recipe. We would recommend that you let it cool upon coming out of the oven, then slice the bread into desired size slices. Afterwards, you can place a small piece of parchment of wax paper between each piece and freeze the loaf. 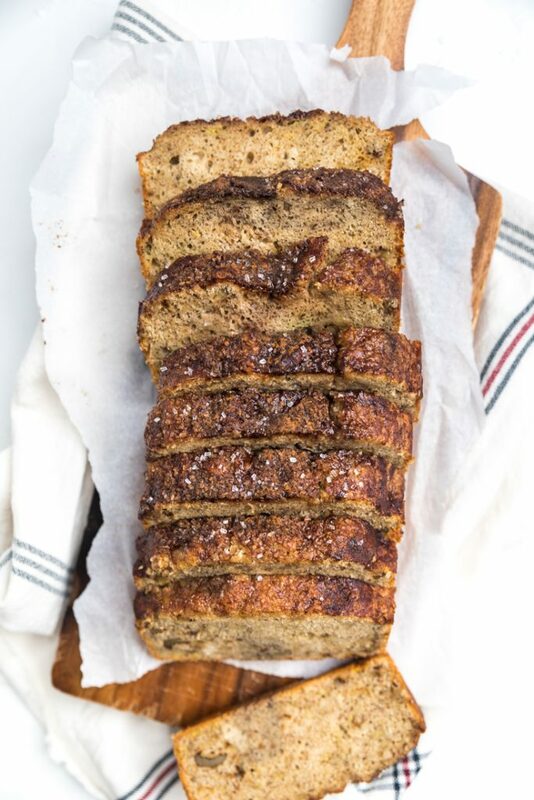 The reason we recommended freezing the dairy free banana bread recipe in slices is because it will make it easier to thaw by being less time consuming. You can remove slices as needed and either place on counter to thaw or place in microwave to thaw more quickly. Of course, you can freeze this vegan banana bread loaf in one whole loaf, but it will take longer to thaw. If doing it this one, remove and set on counter until it comes to room temperature and the middle is no longer frozen. In a large bowl, add the peeled bananas and using the back of a fork, mash them well. No large chunks should remain. Try to mash as much as possible. To the bananas, add in the brown sugar, melted coconut oil, unsweetened applesauce, and vanilla. Stir together with a silicone spatula. Next, sift in the flour, baking powder, baking soda, cinnamon and nutmeg. Add in the salt. Stir again just until combined. Gently fold in walnut pieces if you are adding. Pour into greased bread pan and tap the bottom of the pan to ensure it’s evenly leveled. In a small bowl, combine the sparkling sugar and cinnamon and sprinkle evenly across the top. Place in oven for 35-45 minutes. When done, a toothpick inserted when come out clean. *The top of the bread should be a deep brown color. If after 45 minutes, your bread needs more time, cover the top with foil and continue cooking in 5 minute intervals until the toothpick comes out clean. Remove from oven and let cool for 15 minutes in pan. Then carefully remove and place on a cooling rack until completely cooled. *Top 8 Allergen Notes: If wheat allergy, replace flour with Cup for Cup Gluten Free flour. If tree nut allergies are a concern, skip adding the optional walnut pieces and you can replace the coconut oil with any mild flavored oil or your favorite dairy free safe butter. No other Top 8 allergens should be present, but as always double check your labels.